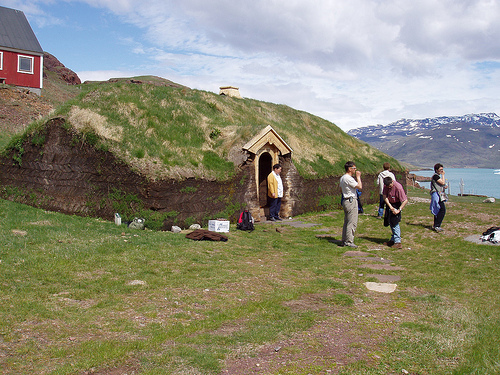 This reconstructed house shows tourists how Norse settlers would have lived in Greenland in the 11th to 13th centuries. The settlers brought with them a variety of adaptations to the cold, barren lands of the North Atlantic, such as building houses out of sod to conserve wood and keep in warmth. But Norse society eventually proved unable to cope with Greenland's climate. To begin our exploration of how the natural environment affects human societies, we need to clarify our conception of the relationship between humans and the environment. Throughout the history of modern social science, two extreme opposite positions have been tempting pitfalls for thinkers: environmental determinism and environment-as-backdrop. Environmental determinism is the view that the natural environment determines the characteristics of human societies. In such a theory, any human or social phenomenon of interest can be explained by pointing to some fact about the environment. In the late 1800s and early 1900s, environmental determinism was the dominant theory in geography. One popular version held that climatic conditions directly affected human psychology, which in turn determined social outcomes. Thus, tropical climates were said to make people lazy and sensual, which in turn was held to explain why tropical societies such as those of Africa or Latin America were not as developed as temperate societies (Huntington 1915). While environmental determinism was decisively rejected by academic geographers, environmental determinist ideas remain popular today -- perhaps because they give morally innocent explanations for the troubling inequalities in our world (Judkins et al. 2008). The idea of environment-as-backdrop holds that the natural environment has little or no direct effect on human societies. Nature is merely a background for human activity. The founder of modern sociology, Emile Durkheim, famously stated that social facts (that is, facts about human societies) can only be explained by other social facts -- not by natural facts (Durkheim 1972). Because of this, sociologists who believe that the environment's effects are important have had to struggle to get their ideas accepted by their discipline. The environment-as-backdrop view remains significant today in the family of theories usually referred to as "post-structuralism" or "post-modernism" (Soper 1995). In their extreme forms, post-structural/post-modernist theories deny that there can be any real truth about nature beyond what human societies have constructed through discourse. What we need is a way of thinking about the environment that recognizes both the influence of nature itself (as in environmental determinism) as well as the ability of human societies to shape their own relationships to nature (as in environment-as-backdrop). A useful way of achieving this is to conceive of the environment as a culturally-mediated source of opportunities and constraints. Thus, the environment does provide opportunities and constraints to people -- but which precise opportunities and constraints they are depends on the culture of the society in question (Sahlins 1964, Morris 2010). As an example, before 1800, the natural environment constrained the Dena'ina people living around what is now Anchorage, Alaska, from having a society centered around maize agriculture. The growing season in Alaska is simply too short to cultivate sufficient maize locally. However, today's people of Anchorage (Native and non-Native) do have a maize-based society, because modern Alaskan culture gives people the knowledge and incentives to establish long-distance trading relationships with regions like the Midwest that can grow maize. Nevertheless, modern technological and economic systems do not always expand the opportunities and reduce the constraints presented by the environment. Imagine if climate change (natural or human-caused) were to raise the sea level at Anchorage by two meters. The pre-1800 Dena'ina would have found that to be a relatively minor constraint, as their campsites could be easily moved farther inland. But modern Anchorage has built huge amounts of port infrastructure at the current sea level, meaning that a rise of a few meters would be a huge disaster for modern society. In order to survive, all societies have to adapt to the opportunities and constraints that their environment presents for them, given their current culture (Butzer 1990, Moran 1991). Successful adaptation can be said to have occurred when all of a society's important values are able to be achieved over the long term. We learned in our chapters on disability, race and ethnicity, and gender and sexuality that societies may have significant internal disputes about what those values are. So whenever we ask whether a society is well-adapted to its environment, we should always ask whose perspective that judgment is coming from. Figure 1: Central Greenland temperatures, 1 CE to 1980 CE. Temperature reconstruction based on ice cores from central Greenland shows evidence of the Medieval Warm Period from 950 to 1250, followed by the Little Ice Age from 1550-1850. The ancestors of the Inuit arrived somewhere around 700-750, and the Norse settlement was established in 986. The Norse settlement disappeared sometime during the 1400s. A classic example that illustrates the complexities of adaptation is the contrasting fates of the Norse and Inuit in Greenland (McGovern 2000). Norse settlers arrived in 986 CE, bringing with them a culture that had been developed in other North Atlantic islands like Iceland and the Shetland Islands. This culture, based around fishing, cattle herding, and farming some hardy grains, had been well adapted to these other North Atlantic environments, enabling the Norse population to succeed and grow. Greenland was a similar enough environment that the Norse could initially thrive. Some time after that, the ancestors of today's Greenland Inuit moved into southern part of the island, bringing with them adaptations to the cold northern climates of Canada's Arctic Archipelago and northern Greenland. Inuit culture lacked agriculture or domestic animals besides the dog, but they had an effective package of technology such as kayaks and harpoons for hunting and fishing to supply their subsistence. After about 1300, the climate in Greenland became colder. Climatologists call the period in which the Norse settled the "Medieval Warm Period," while the cooling after 1300 is called the "Little Ice Age." 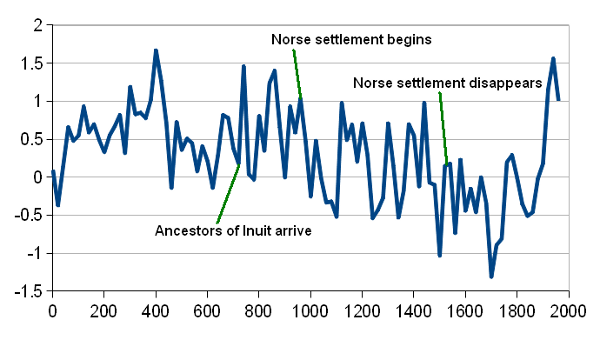 This climate shift presented a challenge for both the Norse and Inuit. In particular, the cooling climate made it more difficult to procure land-based foods like cattle. The Inuit successfully shifted their subsistence strategy to emphasize more seal hunting, enabling their society to survive the Little Ice Age and continue until the present day. The Norse, on the other hand, experienced increasing food supply problems and the settlers ultimately either returned to Iceland or died, leading to the demise of the colony sometime before 1500. The explanation of the difference between the Norse and Inuit fates comes down to how their cultures mediated the constraints and opportunities provided by the shared environment of 14th and 15th century Greenland. The precise course of the collapse of Norse society is a complex problem, but we can examine two features of Norse culture that inhibited it from following the successful Inuit path: xenophobia and hierarchy. Archaeological evidence shows that the Inuit were quite willing to adopt ideas and technology from the Norse. Metal goods manufactured in Europe and imported by the Norse found their way along Inuit trade routes deep into the Arctic. On the other hand, the Norse were resistant to learning from the Inuit, and they never adopted technologies like kayaks and harpoons that would have enabled more effective exploitation of food resources during the Little Ice Age. Norse culture was xenophobic (literally stranger-fearing). Because the Inuit were heathens, it was believed that they had nothing of value to teach representatives of Christian European civilization. Indeed, the Norse name for all the native people of the Americas was "skrælingjar," which means "wretches" -- implying that their way of life was nasty and poor, and not worthy of emulation. Norse society was also very hierarchical. Though the Norse were relatively democratic by medieval European standards (the Icelandic Alþingi is one of the world's oldest parliaments), Norse society still had a clear hierarchy between nobles and commoners. In Greenland, the chieftains had cemented their power by claiming control of the best pastureland. During the Medieval Warm Period, this was an effective source of power, as the climate was suitable for cattle-raising as an adaptation. But as the climate cooled, the chieftains were reluctant to allow Norse society to re-focus on seal hunting and other sea foods, because that would mean giving up their power base. Clinging to cattle-based subsistence served the medium-term interests of the chieftains at the expense of the short-term interests of the commoners and the long-term interests of Norse society as a whole. Because environmental conditions are prone to change, it is often useful to talk about societies as having some level of adaptive capacity (Adger et al. 2006). Adaptive capacity is the ability of a society to adapt if conditions change. It is possible for some society to be very well adapted to the current environmental conditions, but to have very low adaptive capacity, so that a change in the environment will lead to severe maladaptation. It was once popular among geographers and anthropologists to believe that adaptation was not something societies were conscious of -- particularly small-scale, "traditional" societies. Research had documented that these societies lived in balance with their local ecosystems, never undermining the sustainability of the system. But this was not a conscious choice � rather, they had stumbled upon a solution, and since that solution worked, their society survived while societies that pursued different paths collapsed. One famous example was the cycle of pig-raising, war, and feasting among the Tsembaga people of New Guinea (Rappaport 1971). The details of the cycle are too complex to go into here, but the main point is that the Tsembaga do not see it as serving to ensure adaptation to their environment. They see it as demanded by their religious beliefs. Those religious beliefs function to make the society well-adapted, without the people catching on to what's happening. Some people have urged modern societies to take up pro-environmental religion in a similar way -- get people to believe not because the doctrines about God are necessarily true, but because believing them is useful for society. 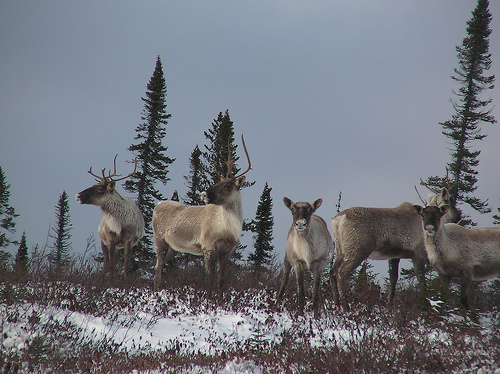 Figure 2: Reindeer herd in James Bay, Canada. Biologists have integrated traditional ecological knowledge from local First Nations people into their understanding of reindeer population dynamics, enabling them to manage the species better than if they had had to rely on scientific studies alone. However, in many situations, maintaining social adaptation to the environment requires knowledge of how the environment works, and what options for human action are feasible. When people have incorrect ideas about the environment but by coincidence happen to practice a well-adapted way of life, there is always a risk that a change in circumstances will make the old adaptation into a maladaptation. For example, some Native American societies traditionally believed that some game animals were provided by the gods, rather than being born to whatever animals survived the previous year's hunt -- and therefore that excessive hunting would not destroy the supply of game. This belief did not prevent these societies from being well-adapted to their environments because massive overhunting was technologically unfeasible. But when the introduction of firearms greatly increased the effectiveness of their hunting (and European demand for pelts greatly increased the demand for further hunting), the belief in an inexhaustible supply of game led quickly to severe overhunting (Krech 1999). Discussions of knowledge about the environment often break it down into two main categories -- science and traditional ecological knowledge. Science can be defined narrowly as the product of the official modern scientific establishment, or more broadly as any knowledge arrived at through a conscious quest for knowledge that applies norms of hypothesis generation and testing. Science aims to produce reliable generalizations about phenomena in the world, which will allow us to explain, predict, and control them. Typically, science is quantitative (based on numbers) and abstract. Traditional ecological knowledge (TEK) is knowledge about how the environment works that has been accumulated through generations of experience with a particular environment (Berkes 1999). Unlike the Tsembaga religious beliefs that just happened to also ensure sustainable resource use, TEK is consciously recognized as information about the environment. But it may be passed down through demonstrating and teaching skills, rather than being codified into a series of factual statements (Ingold 2000). TEK is usually qualitative, as well as specific to the environment in which it developed (rather than generalizable to many environments). There is a long tradition of privileging science over TEK, with scientific and political elites insisting on imposing solutions based only on scientific findings, despite the fact that TEK could have pointed out why the plan was bound to fail (Leach and Mearns 1996). On the other hand, there are thinkers who insist that science has no place in understanding the environment because its abstraction makes it invalid (Deloria 1995). Today, some of the most successful solutions to environmental problems have come from finding ways to combine science and TEK, drawing on the complementary strengths of both kinds of knowledge (Kendrick 2003). Science and traditional ecological knowledge can be great guides to adapting to the environment. Unfortunately, novel and rapidly-changing environmental conditions can outpace either. Any environment generally has what's called a historic range of variability -- the range of conditions (high and low temperatures, frequency of storms, etc.) that that environment has experienced in the past. TEK can usually give you good information about what to do when the environment is within the historic range of variability, but when conditions are outside that range, TEK has not had time to develop an answer. Science may likewise be stumped. Valid scientific research, with adequate control groups, takes a long time to complete, especially on landscape-level phenomena that can't be controlled in a lab (Whelan 1995). Unfortunately, major environmental changes like anthropogenic climate change are putting many of our world's environments outside their historic range of variability. Adaptive management is one possible solution to this dilemma (Gunderson and Holling 2001). Adaptive management is, at its base, a strategy of treating each action as an experiment. Rather than looking for complete information before beginning to decide how to adapt to an environmental condition, adaptive management aims to generate information through attempts to adapt. Adaptive management insists on extensive monitoring of the effects of policy choices so that we know what happens when we catch a certain amount of fish, or apply a certain fertilizer mix, or conduct controlled burns at a certain time interval. This information, which may not meet strict scientific standards of proof, is then used to advise further choices about strategies for adaptation, which are then in turn monitored to see how they worked out. Adger, W. Neil, Jouni Paavola, Saleemul Huq, and M. J. Mace, eds. 2006. Fairness in Adaptation to Climate Change. Cambridge, MA: MIT Press. Berkes, Fikret. 1999. Sacred Ecology: Traditional Ecological Knowledge and Resource Management. Philadelphia: Taylor and Francis. Butzer, Karl W. 1990. The realm of cultural-human ecology: adaptation and change in historical perspective. In The Earth as Transformed by Human Action: Global and Regional Changes in the Biosphere Over the Last 300 Years, ed. B.L. Turner, W.C. Clark, R.W. Kates, J.F. Richards, J.T. Mathews, and W.B. Meyer, 685-701. Cambridge: Cambridge University Press. Deloria Jr., Vine. 1995. Red Earth, White Lies: Native Americans and the Myth of Scientific Fact. New York: Scribner. Durkheim, Emile. 1972. Emile Durkheim: Selected Writings. Cambridge: Cambridge University Press. Gunderson, Lance H., and C.S. Holling, eds. 2001. Panarchy: Understanding Transformations in Human and Natural Systems. Washington DC: Island Press. Huntington, Ellsworth. 1915. Civilization and Climate. New Haven: Yale University Press. Judkins, Gabriel, Marissa Smith, and Eric Keys. 2008. Determinism within human-environment research and the rediscovery of environmental causation. Geographical Journal 174 (1): 17-29. Kendrick, Anne. 2003. Caribou co-management in Canada: fostering multiple ways of knowing. In Navigating Social-Ecological Systems: Building Resilience for Complexity and Change, ed. Fikret Berkes, Johan Colding, and Carl Folke, 241-267. Cambridge: Cambridge University Press. Krech, Shepard. 1999. The Ecological Indian: Myth and History. New York: W.W. Norton and Co.
Leach, Melissa, and Robin Mearns. 1996. The Lie of the Land: Challenging Received Wisdom on the African Environment. Oxford: The International African Institute. McGovern, Thomas H. 2000. The demise of Norse Greenland. In Vikings: The North Atlantic Saga, ed. William W. Fitzhugh and Elisabeth I. Ward, pp. 327�339. Washington DC: Smithsonian Institution Press. Moran, Emilio F. 1991. Human adaptive strategies in Amazonian blackwater ecosystems. American Anthropologist 93 (2): 361-382. Morris, Ian 2010. Why the West Rules -- For Now: The Patterns of History, and What They Reveal About the Future. New York: Farrar, Straus & Giroux. Rappaport, Roy A. 1971. The flow of energy in an agricultural society. Scientific American 225: 116-132. Sahlins, Marshall D. 1964. Culture and environment: the study of cultural ecology. In Horizons in Anthropology, ed. S. Tax, 132�147. Chicago: Aldine Publishing Company. Soper, Kate. 1995. What is Nature? Culture, Politics and the Non-Human. Cambridge, MA: Blackwell. Whelan, Robert J. 1995. The Ecology of Fire. Cambridge: Cambridge University Press.